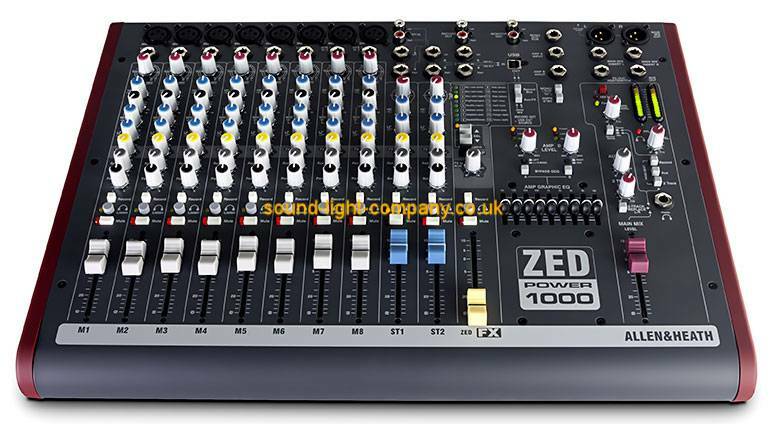 ZED Power 1000 is a rugged, reliable powered mixer that is built to deliver outstanding audio quality night after night. Created for gigging musicians, schools, PA and AV rental companies, hotels and conference centres, ZED Power 1000 is the professional choice for power and performance. ZED Power 1000 is designed and built to Allen & Heath's legendary standards to ensure a long life in the toughest of live sounds environments. All channels are on individual, vertical circuit boards and all rotary controls are secured to the front panel with a steel nut to guard against impact damage. Selected for maximum ruggedness and low distortion, ZED packs enough power to comfortably rock 200-300 capacity venues with no distortion. The output can be set to feed L+R speakers, or Mono LR + Foldback, or Mono LR + Sub. ZED Power 1000 has a built in, 2 channel, high power class D amplifier, coupled to a super-reliable linear power supply. This combination provides the best of both worlds--the cool running efficiency of class D amplification allied to the proven robustness and peak headroom of a toroidal power supply, with the ability to cope with high demand surges. ZED Power 1000 offers a super convenient solution for high quality PA on the move. The mixer weighs in at a modest 10.3kg (24lbs) and there is a tough carry handle built into the chassis, making it easy to take the mixer into the most challenging of venues. A flexible USB connection allows playback to / from a computer, so capturing a high quality stereo recording of the show or playing walk-in music or backing tracks from a laptop could not be simpler. Two of the mixer's jack inputs can take a normal line level or a low level, high impedanceÿinput from a guitar pickup, so guitars can be plugged straight into the mixer without the need for DI boxes. These inputs have been crafted to recreate the sound of a classic tube preamp in a combo or head amp for incredible definition and warmth. The ZED preamps are developed by Allen & Heath's pre-eminent analogue designer, Mike Griffin, and have earned an enviable reputation in pro audio circles for their exceptionally low noise and high headroom. Our passion for quality extends to the FX. Put simply, cheap FX sound cheap. That's why we decided to invest the energies of our R&D team in crafting 16 of our own time-delay FX that we are proud to put our name to. Professional touches like outputs on XLRs, inserts on the masters and sweepable mids on the EQ set ZED Power 1000 apart from the many semi-pro powered mixers on the market. Our attention to detail can also be felt from the Neutrik jacks and XLRs right through to the smooth glide ALPS faders - we don't use the cheap components found in budget mixers.